Kate Baldwin is appearing at the Barnes & Noble Lincoln Triangle at 5:30 today. She'll perform some songs from her terrific new solo album, Let's See What Happens, and do a signing as well. 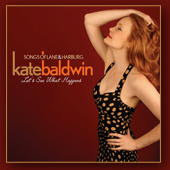 "Let's See What Happens," Kate's first solo outing, was officially released on Tuesday. It is a fabulous recording. The quality is terrific - beautiful arrangements and in listening quality. Even better, it's a fabulous mix of toe tappers and heart tugging tunes. Kate's voice is clear as a bell; at times she's belting, while other times she's honestly singing from her heart. She's captured the art of singing a song - there's acting there and the point of each song comes across beautifully. In "Moments Like This" and "Paris is a Lonely Town", I can just see her standing before a big band in a 1940s night club. The uptempo songs are reminiscent of big band swing days and they make me want to get up and dance. "That Something Extra Special" from the flop musical "Darling of the Day" is simply gorgeous. Any fan of "Finian's Rainbow" will be happy to have this definitive recording of "How Are Things In Glocca Morra?" before the revival cast album is even recorded. There's no pandering to the contemporary popular. It's a lovely mix of timeless tunes by Yip Harburg and Burton Lane that are nothing less than classics, even if some are little known. But make no mistake, these tunes aren't old fashioned. Kate has infused youth into them. There's nothing about Kate that's old fashioned - she's timeless and classic. A few weeks ago, I received an advance copy of "Let's See What Happens" and it has been at the top of my rotation ever since receiving this gem. It's sublime in every way.